I'm sitting here watching the Olympics and am getting anxious for the men's final relay. I thought I'd try to distract myself by sharing another fun FREE event in Tulsa. My friend, Daniel, sent the link to me. 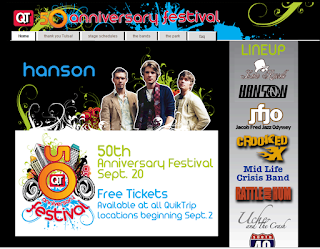 QuikTrip is celebrating their 50th anniversary September 20th with a music festival and firework show! If you like the 4th of July spectacular, you don't want to miss this and what their website states will be "almost twice as many fireworks as Tulsa’s annual 4th of July celebration." Check out their website for more info and make sure you don't miss the FAQs page, hilarious! For great shots around Tulsa, check out Daniel's Flickr photostream! Go Phelps and team USA! And I just watched Michael Phelps win his eighth gold medal in the 2008 Olympic games!!! Amazing! Glad this post was on Tulsa stuff...when I first saw it I only noticed Hanson and thought "wow didn't know Les was such a fan!"